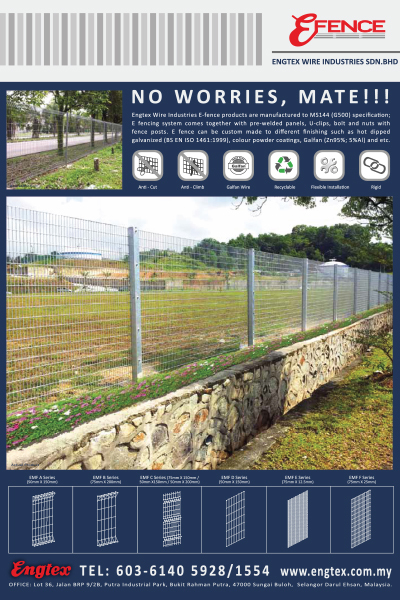 Engtex Wire Industries E-fence products are manufactured to MS144 (G500) specification, E fencing system comes together with pre-welded panels, U-clips, bolt and nuts with fence posts. E fence can be custom made to different coatings finish such as hot dipped galvanised (BS EN !SO 1461:1999), colour powder coatings, Galfan (Zn95%; 5%AI) and etc. Fabricated gates (Double leafe & single gate) and sliding gates, with options of hot dip galvanized or epoxy coated. Galvanized Posts - SHS/RHS/Ultragal pipes (round) that comes in different length, diameter and thickness. Stainless steel bolt & nuts, stainless steel U-Clips, hot dipped galvanized steel caps and etc. We also provide our client with installation service of the fencing as well as construction of concrete base and kerb for the fencing base.